I was amped for the Valentino exhibition – after all, who doesn’t like a bit of fashion voyeurism? I was slightly put off by the price (£12.50 eek!) but forged ahead and took myself off to Somerset House. The clothes were amazing, it was incredible to see red carpet dresses up close. The detail is indescribable – such talent has gone into their creation. I also found it a bit of a mind trip, some of my favourite dresses (that I had seen on TV) gave a completely different impression in person. The exhibition itself was ruined for me because of my expectations. A few years ago I was lucky enough to go to the YSL exhibition at the Grand Palais in Paris. It had the same high standard of design and creation, but the display was a visual feast. 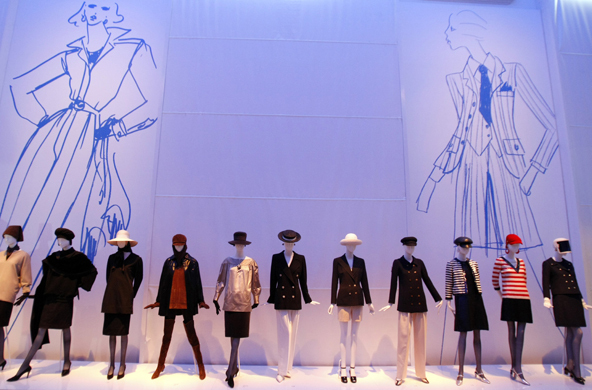 There was a corridor of mannequins showing the timeline progression of the trench-coat; there was clothes grouped/displayed by colour, era, theme and event (pictures below). It gave the chance to wonder at the clothes, but also gave an overall YSL impression – you were in the world of YSL. In comparison the Valentino exhibition was just the simple white corridor at the top of the post. Great content, but very crowded and I don’t think it did the clothes justice. It was an adequate (if expensive) display of clothes, but it completely missed out on an immersive Valentino experience. Would you like £8,000? All you need to do is like art.